Jonah Hex is coming to DC’s Legends of Tomorrow. New episodes return Thursday, March 31 on The CW. At this weekend's Wondercon in Los Angeles, attendees for the 'Legend of Tomorrow' panel got a first look at the sizzle reel for the second half of the show's first season. 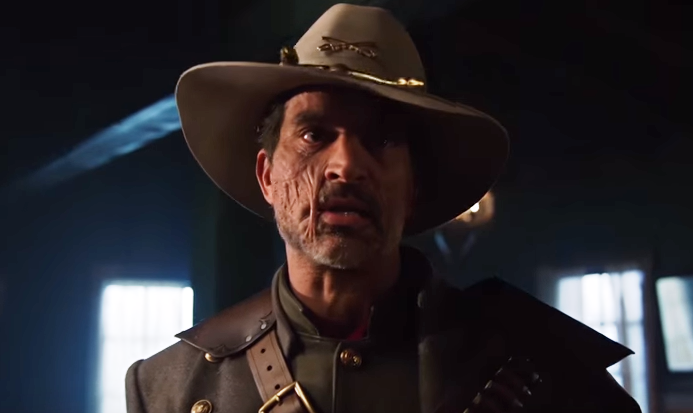 The video featured a look ahead including the first glimpse of Johnathon Schaech as DC Comics' infamous scarred-face bounty hunter Jonah Hex. "Progeny" Rip (Arthur Darvill) tells the team they are headed to the future to take out a powerful ally that Savage (guest star Casper Crump) needs in order to conquer the world. However, when Rip reveals the ally is a 14 year-old boy (guest star Cory Gruter-Andrew) who will one day grow into an evil dictator, the team is split about the morality of killing a child, even if it does save the world. Meanwhile, Sara (Caity Lotz) talks Snart (Wentworth Miller) through a rough patch and Ray (Brandon Routh) learns something that could impact his future with Kendra (Ciara Renée). David Geddes directed the episode written by Phil Klemmer and Marc Guggenheim (#110). Quentin Lance, Felicity Smoak, Ra's al Ghul, Nyssa and a young Talia al'Ghul all make an appearance in the montage of upcoming episodes. Jewel Staite's role remains a mystery as we only get a brief look at her. Executive producer Marc Guggenheim and cast members Ciara Renee (Kendra/Hawkgirl), Brandon Routh (Ray/Atom), Caity Lotz (Sara/White Canary), and Franz Drameh (Jax/Firestorm) appeared on the panel discussing the state of the show and where it's headed. "At the end of this season, you will get a definitive end of this chapter. You'll get an answer about whether or not the team succeeds to stop Vandal Savage. You'll get a resolution of the love triangle. You'll get to know more about what the Time Masters are up to. I don't think there are too many unanswered questions at the end of this season." Guggenheim went on to explain his motivation for choosing Vandal Savage as the main villain. "There was an issue of Flash from Volume 1 where Vandal is punching The Flash and kicking the Green Lantern, and that was one of the first comic books I owned. It made an incredible impression on me." When asked who the cast would like to see join "Legends?" "I'd love to see more girls," Renée said. "I'd love it if Vixen could be on." Routh mentioned John Constantine and Vixen. "I think it'd be awesome if Killer Frost came back and was on our show," Routh said. "A rogue woman character." "I think we need some Speedy," Lotz said, referencing Arrow's Thea Queen (Willa Holland). "And I like Iris West." Guggenheim agreed that "we definitely need more women on the show. Megalyn [Euchikunwoke] is welcome on any of the shows, anytime she wants," Guggenheim reassured the audience. Legends of Tomorrow returns on Thursday, March 31, at 8:00pm on The CW.